Every child…Every Year. 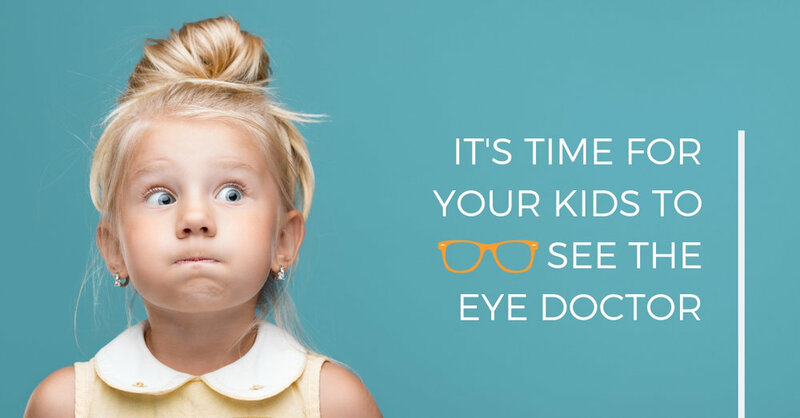 Your kids should have a comprehensive eye exam every year by an optometrist. It should include both a sight test and a complete eye health exam. Thank you for trusting Stonewire Optometry in Kingsway Mall with your families eye care needs. as recommended by your optometrist during their last visit. Maybe it feels like you were just here, but kids grow up quickly, and their vision and visual needs change over time. Your eye doctor wants to ensure that your kids are not struggling at school and that they are able to do their best. It is why our optometrists recommend that every child should have an eye exam every year, as children seldom complain of problems. Do they have problems seeing the board from the back of the classroom? Do they come home tired with sore eyes? Do they have headaches at the end of the school day? Do they avoiding reading books? Do they rub their eyes a lot or get watery eyes? Vision problems manifest themselves in many ways, and some of them may not be as obvious as others. A routine eye exam every year can help ensure that your child sees their best while uncovering any problems that may not be as obvious. Q: Can my child wear contact lenses? A: Absolutely. We regular fit children into contact lenses. Please talk to your optometrist during your next eye exam to discus the options available. We will also need to schedule your child in for a contact lens training with one of our technicians to ensure that they know the proper way to handle, insert, remove and care for their contacts. Q: Do the new blue light filter lenses actually work? A: Blue light ophthalmic lenses filter out the high-intensity blue light from computer monitors, TV’s, cell phones and classroom lights. Many children report that it reduces the strain they feel on their eyes and helps to reduce their end of day headache-like symptoms. Please talk to your optometrist about whether or not they are right for your child. Q: What should I do if my child gets pink eye? A: Pink eye is a viral infection that does not respond to antibiotic eye drops or over the counter pink eye drops. The best thing to do is to wash around the eyes with a warm face cloth and to use preservative free lubricating eye drops. We also recommend that you bring them in to see us, to ensure that they don’t require medicated eye drops. Alberta Health Care covers these types of eye care visits, so there is no cost to you. Children are covered under Alberta Health Care for an eye exam by an optometrist every year. If your child has already received an eye exam between the July 1-June 30 billing cycle, they may not be covered and regular rates apply. If you have any questions or concerns, please ask our staff and they will be happy to answer your questions.